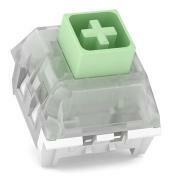 The Kailh BOX Jade features the same spring as the BOX White, but with a thicker clickbar. A hair less satisfying than BOX Navies, but if you have weak fingers, you might have to settle for this one instead. Have experience using Kailh BOX Thick Jade switches? Add a review to share your knowledge with the keyboard community.